A new boy band has been formed by legendary music manager Johnny Wright (*NSYNC, Backstreet Boys, Jonas Brothers, Britney Spears, even my girls in PYT for a brief period of time), attempting to make up for the absence left by NLT's pre-debut album release break-up. The group will be called One Call and is set to feature former NLT member Justin (formerly nicknamed "JJ") Thorne. From what I gather, fans were expecting V Sevani, another NLT member, to also be in the group, but alas, this appears to not be so. The group will also feature Chris Moy and Jose Bordonada, who were also involved in another false start boy band, the revamp of Menudo, who had a (very) modest hit with "Lost" back in 2008 (although - it was pretty good, especially the Spanish version) before being dropped from their label. Well, Ricky Martin surely used Menudo as a springboard...maybe these boys will too. 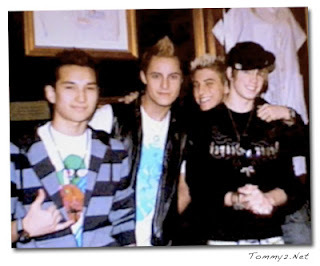 Sidenote: Menudo, NLT and V Factory all toured together in 2008 via a promotional tour dubbed "Bandemonium" (but should have been called "BoyBandemonium"), which is surely where these boys met each other. A fourth member, Anthony "AG" Gamlieli, is also involved, although he has no previous boy band experience. The group is already involved in the recording process, reportedly working urban producer Darkchild (obviously going after NLT's r&pop formula). Despite the fact that no music has been leaked/released, and no formal record deal has been signed, the group already has over 1000 fans on their MySpace, and a dizzying amount of MySpace street teams and fanpages. This is all since the page first launched about a month ago, and it still remains starkly sparse. i'm ready for A boyband to do well. i'm still staked behind v factory (which simon curtis was almost a member of!!) but i'm happy for anyone to burst forth with an amazing tune or two! Oh dear, these boys better give us some solid material or else they'll be just like everyone else. V Factory have been making good progress these past few weeks - I hope they actually get somewhere. Nikki - Ditto. I think they are going to find it hard to be "not like them" (haha) this late in the game. And by them I mean V Factory and VFC.